Summer tarts are a lovely idea for lunch or teamed with a side salad for a tasty dinner. They’re easy to make and absolutely delicious and this summer tart recipe is totally gluten free. Despite the name summer tarts also make a great meal in the winter when served hot. It's tasty and light and everyone will enjoy tucking in! Plus it's vegetarian so all your guests can enjoy. This delicious summer tar will serve four people as a snack or two people as a main people if you serve it with a green salad or even a medley of green vegetable, try broccoli, mange tout and green beans. You will need two large green peppers, 2 tablespoons of olive oil, one packet of savoury gluten-free pastry, 5oz of feta cheese, a handful of basil leaves, two tablespoons of balsamic vinegar, 10 tablespoons of homemade tomato sauce, three tablespoons of gluten-free pesto and a 8 inch flan tin. For the tomato sauce you will need two onions, two tablespoons of olive oil, sugar, one teaspoon of crushed garlic, two tins of chopped tomatoes and salt and pepper. Make the tomato sauce first. Add the oil to a saucepan and heat gently. Chop the onions and add to the pan with the teaspoon of garlic. Cook for a few minutes until the onions soften. Once the onions are soft add the tinned tomatoes. Stir in and cook for a couple of minutes. Add plenty of salt and pepper and a teaspoon of sugar. Put the lid on the saucepan and cook for about 15 minutes on a low heat. Turn off the head and set aside. Now it’s time to start on the tart! First preheat the oven to gas mark nine. Place the pepper, whole, on a tray drizzled with a little olive oil and cook in the over for half an hour until they are soft. Once they are soft put them aside in a bowl and let them cool. Once they are cool cut into strips. Now turn the oven down to gas mark five. Roll the pastry and line the tin with it. Line with oven proof paper and bake the pastry until it is golden. This will usually take about 10 minutes. Remove from the over and take out the paper. Brush the pastry with beaten egg and cook in the oven for a further five minutes. Remove from the oven, add half of the feta cheese. Next add a layer of peppers and a few basil leaves. Add salt and pepper and then spoon some of the tomato sauce mixture over the top. Repeat this process once again, starting with cheese then adding peppers then the basil leaves and finally the sauces. Keep a little of the cheese back though to top the tart. Once you have added the cheese bake the tart in the oven for fifteen minutes. 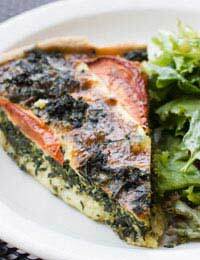 Remove from the over and spread some pesto over the tart. Serve piping hot. This summer tart makes a great addition to any garden party and because its vegetarian and gluten-free all your guests can took in and enjoy. Always check all the ingredients on any product you use to make sure you are not consuming any gluten products.